Stunning black pewter raven with wings outstretched flies on a genuine black leather adjustable strap bracelet. 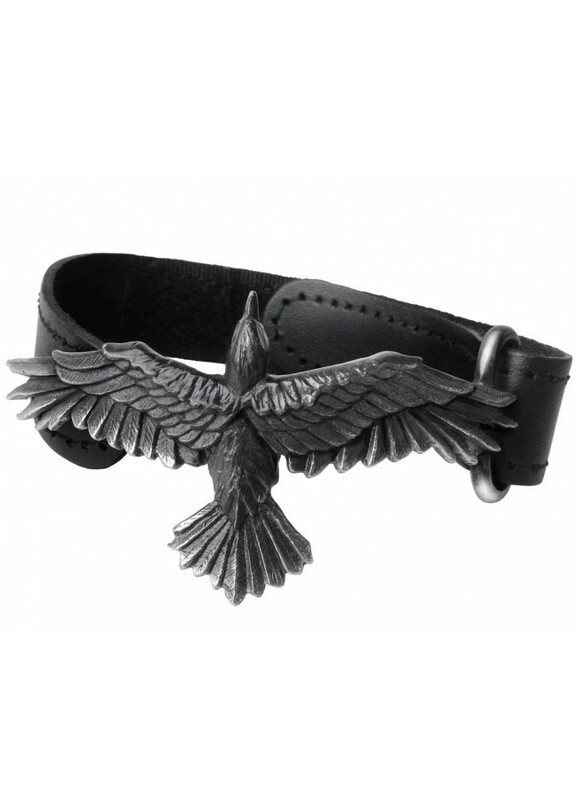 Finely detailed black pewter raven is mounted on a genuine leather wrist strap with adjustable closure. The leather strap is 8 1/2 inches long wih the raven adding another 2 inches to the overall length. There is velcro inside the band allowing you to change where it attaches to the raven to shorten or lengthen it as needed. Adjusts the strap length from about 4 1/2 inches (or 6 1/2 inch bracelet) up to about 6 1/2 inches (or 8 1/2 inch bracelet). Raven could be removed from the strap if desired and is curved to fit comfortably on your wrist. Item Number: AG-A109 | Approximate Size (Inches): 10.35 wide x 0.12 deep x 1.42 high | Approximate Shipping Weight: 0.25 lbs. In two-tone, blackened pewter with polished mount on a 27 inch ball nick.. Dark and sultry feathered companions make sure your admirers do not underes..